Skype — free software that provides encrypted voice communication over the Internet between computers (VoIP), as well as paid services for calls to mobiles and landlines. You can also use Skype on your BlackBerry, but only for the transmission of messages, the function calls to Skype BlackBerry available. You can download Skype for BlackBerry free by clicking on the link imo.im/blackberry from your smart phone. Do not forget to have an account on imo.im site! If you have any difficulties, please contact us. Our experts can also install many other programs . Appendix imo is very convenient, and is also working on a tablet BlackBerry PlayBook. You can use Skype voice and video calls on the PlayBook. 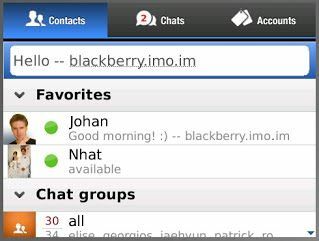 To use Skype on BlackBerry PlayBook, simply open the site in imo.im tablet browser and log on with your account IMO. WiFi-connection is required.